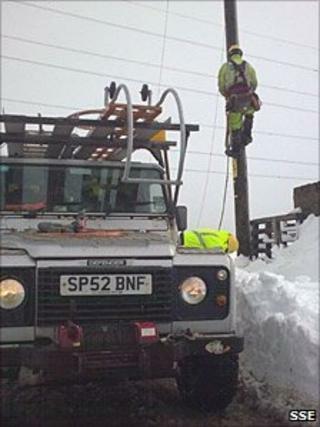 Specialist engineers have been drafted from the south of England to help tackle power line problems in Scotland after forecasts of bad weather. Scottish and Southern Energy (SSE) said the 30 additional staff were travelling north while conditions were fine. SSE said recent rain followed by predicted snow and subzero temperatures could freeze lines and bring them down under the weight of the ice. The company said its hydro-electric network could be affected. The extra staff from SSE company Southern Electric Power Distribution will be based in Aberdeen and Inverness. They will be available in addition to hundreds of Scottish-based workers, a fleet of four wheel drive vehicles and support staff. The action follows a weather warning from the Met Office about heavy snow affecting the north of Scotland before moving south. A spokeswoman for SSE said the company was doing everything it could to prepare for any potential problems. In the north of Scotland its overhead and underground power line network stretches to about 77,671 miles (125,000km). The spokeswoman said it emerged largely unscathed during the most recent period of severe winter weather. But she added: "It is slightly different this time. "Our team of weather experts who work closely with the Met Office are warning there could be a risk of line icing. "Given these circumstances we are bring in additional staff and will be doing everything we can to keep the lights on."